The tournament to crown the new world champion begins on September 20th. Teams from 9 regions around the globe will compete through the tournament to make the final 18 to represent their regions. The first two Finalists of the 2016 World Championship - Korea and China - will automatically enter the <TOP SEED> in the Quarter-Finals. One team of the Korean representatives will be selected from <Korean Wildcard Tournament>. The game will be open to the public at Sangam e-Stadium in Seoul. A total of 18 regional representatives will compete fiercely against one another to become the World Champion. Excluding the two teams in the <TOP SEED>, the remaining 16 teams will be seeded into four brackets of four teams and play in the "Dual Tournament". The top six teams will play in the Quarter-Finals. A total of six teams will enter the Quarter-Finals. These teams are the 1st place teams from brackets A - D, as well as the 1st and 2nd place teams from the Bracket Match. 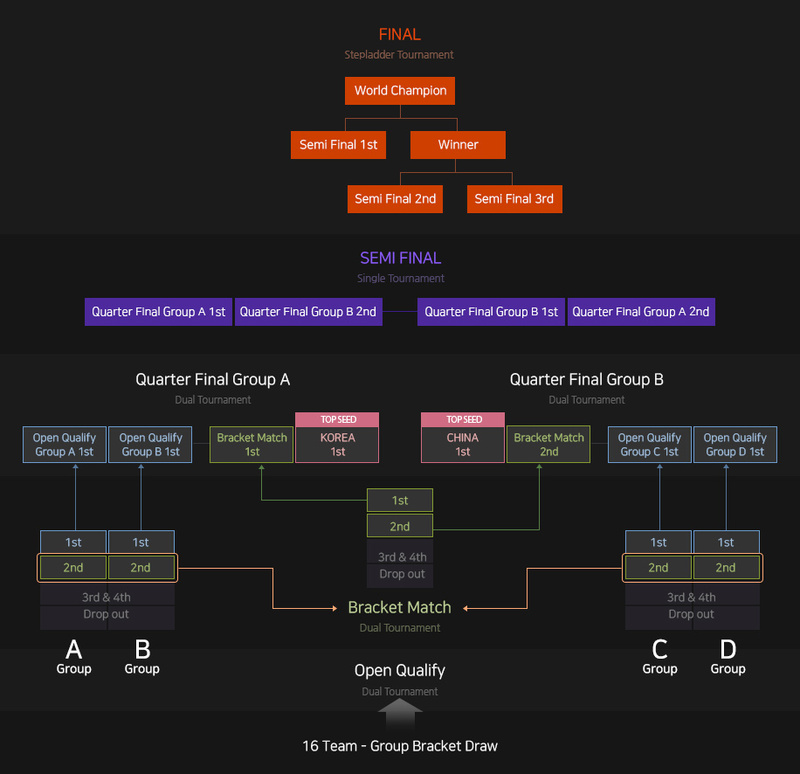 The top six teams and the two teams in the <TOP SEED> will be seeded into two brackets, then compete in the "Dual Tournament" in order to enter the Semi-Finals. The 1st and 2nd place teams from brackets A and B enter the Semi-Finals. The remaining four teams will then play in the "Single Tournament", with the top three moving on to play in the Finals. The top three teams will enter the Finals. Find out who will become the champion of this year's fierce step ladder tournament.